Dean Bell – for Wigan v. Warrington in the 1990 Cup Final. Photo memories of Fartown stars Lionel Cooper and Johnny Hunter. St.Helens celebrate their heritage in numbers. The Double Lions part two – players at the pinnacle in both codes of rugby. Trawlermen v Dockers - the passion of the early post-war Hull derbies. Red Rose to Red Devils - Salford’s former England Rugby Union internationals. Featherstone Rovers out on the road in London, Wales and Ireland. What’s happening in British Rugby League’s own player development? How Swinton helped Daryl Pierce become the man who broke the transfer ban. Ex-York captain Les Sheard looks at the great potential of the Minster City. John Wasyliw – Keighley’s prolific points scoring machine. Alex Cassie –class of the Borders from Melrose to Whitehaven. Joe Chamberlain – a fine all-rounder for Rochdale Hornets. Castleford’s ‘A’ team double-winners of 1972-73. When Oldham and Rochdale combined to beat the New Zealanders. What was wrong about Leeds’ famous Championship Final win in 1961? Ged Smith, Barrow’s tiny scrum-half, preparing for Wembley in 1967. Kells built the foundations for professional club in Whitehaven. Alf Francis - family memories of the Hull’s 1914 tourist. Leeds and Castleford in 1958 paying tribute to victims of the Munich air crash. Doncaster taking on Wigan at Tattersfield in the 1989 Challenge Cup. French Rugby League’s complete history now told. 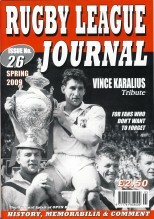 New Hunslet’s hard luck story of 1977-78. Parry Gordon – a Warrington great. A famous Hilton Park landmark at Leigh. Team photos including: Workington Town (1976), New Hunslet (1977-78), Bradford Northern (1969-70), Widnes (1971), Swinton (1974-75), Leigh (late 1950s), Dewsbury (1980), Kells 1946. 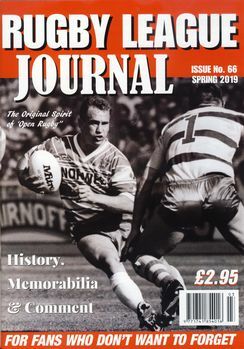 Obituaries and tributes to: Gert ‘Oupa’ Coetzer; Peter Goodchild, John Mantle, Dave Parker, Laurie Hinchliffe, Wilf Rosenberg, Jimmy Bargett, Cyril Woolford, Gary Waterworth, Jackie Fennell, John Lindley, Laurie Gilfedder, Clarrie Owen, Grosvenor Thomas, Garfield Owen, Frank Mugglestone, Alan Winward, Kia Bose, Denis Whittle and more.